What is your role at Hand in Hand? I am the Creative Director at Hand in Hand. I make sure our brand is always unique, innovative, and beautiful! What is your favorite part of working for Hand in Hand? My favorite part of working at Hand in Hand is making our soap donations and digging wells in Haiti. It's the most amazing thing to see the faces of all the kids and communities we are helping. What is your proudest moment at Hand in Hand? Having been able to make a product that people love that also gives back in such an impactful way. Our first trip to Haiti was something I won’t ever forget/my most proud moment — when we saw our first bars of soap in the hands of the kids at Bon Sam orphanage. I spend time with my little lady, our 6mo Finley, singing and having picnics in the park. 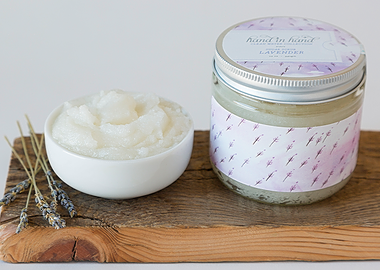 Our sugar scrub (a fan favorite!) has a delicate balance of extra fine sugar, select oils & shea butter, leaving the skin soft and completely rejuvenated. 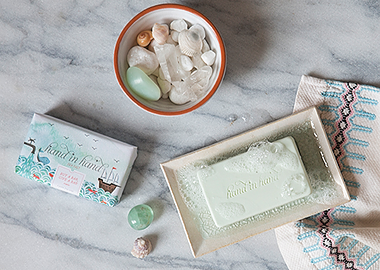 Ethically harvested from sustainable resources made up of natural ingredients, our triple milled shea butter bar soaps are sure to be soothing to your skin & senses, gentle on our environment and a beautiful complement to your home.